I've been reading forum posts on portaging - here and other sites - and it would seem that I am missing something. I rented a super-light Kevlar (42lbs) and made a trip to Algonquin's Booth Lake, starting from access point 17. This was my 2nd, multi-day, canoe trip. The 550m (650 according to jeffsmap) just about killed me. Not huffing or puffing and my legs were fine - it was my shoulders. Within 100m it felt like I was on some sort of torture device. I'm talking excruciating pain. It had a carved yoke and I brought my own yoke pad (Level 6). I'm 5'10 and weigh a slightly pudgy 185 lbs. I suffered the same pain on my previous trip, also to Algonquin (Rock, Pen, Clydegale). Different canoe make/model. Any help would be appreciated - being able to portage further would certainly help to open up more possibilities. For me, tensing my traps into the yoke makes the carry much more uncomfortable. Relaxing and allowing the yoke to sit on soft accommodating muscles makes a difference for me. On longer carries, I'll tie the painters front to back with enough slack that they droop to where my hands naturally hang so I can portage with my hands by my sides, adjusting the attitude of the canoe by working the ropes. For me, this relaxes my shoulders even more than grabbing the gunwales and makes the carry less irritating. What worked for me was getting a life-jacket with extra bulky padding over the shoulders and wearing it. If the pain is excruciating (not just a regular workout burn), then you might be dealing with a bigger issue and may want to see a doctor. Otherwise, getting the traps used to it is a big part of it. Break up the portage into increments that you're comfortable with. When I was starting out, I used 300m intervals. Drop the canoe there, go back for your gear, and you can stagger it that way. Like any physical activity, it takes conditioning. I also wear a regular size backpack (my tackle box) to provide padding on the shoulders, but just as importantly the backpack is the right size/height so that I can tilt the yoke into it a little bit. That takes some of the weight off my shoulders and pushes it into my back. Also, make sure your tilting the front end of the canoe up slightly or the contoured yoke will dig down into your shoulders on its edge. For me, hunching over a little bit makes the yoke more comfortable vs. standing straight up. As a personal trainer i highly agree with open side up. when your portaging are you hanging on to the gunnels? If u are then this will make you lift your shoulders and cause your scapula tense up. i do something similar to what open side up said, i have a cheater line that is attached to the front of the canoe and at the other end i have a small caribiner that i clip onto one of the belt loops on my pants. The caribiner is tied on with a taut line hitch and this way i can tighten the line so the canoe can sit on my shoulders and my arms can hang normally. This doesn't work 100% all the time, but it helps keep your arms in a normal position for a good amount of the portage. Also try reaching forward and grabing the thwart with one hand/arm and letting the other arm swing naturally at your side and switch arms constantly. Switch your positioning up as much as possible, that way no muscles get over fatigued. Make the canoe yoke described in Canoeing Wild Rivers by Cliff Jacobson. You will never look back. Carved yokes never worked for me. The Jacobson yoke has yoke pads with thick foam padding, and lots of room to shift the canoe around. I have made about 10 of them over the years and they take the pain out of portaging. Realistically with such a light canoe you should be able to carry it a km or more without resting. A i have a cheater line that is attached to the front of the canoe and at the other end i have a small caribiner that i clip onto one of the belt loops on my pants. The caribiner is tied on with a taut line hitch and this way i can tighten the line so the canoe can sit on my shoulders and my arms can hang normally. Deep dish yokes kill me. I've outfitted all of my canoes with minicell foam yoke pads mounted on flat yokes. Each one is 1/2" thick so I double them up to 1". Very comfortable and you can position the canoe several ways on your shoulders with just a flat yoke and pad. The bow to stern painter line works well too. Another piece of gear to have a multi-use for. I use quality paracord for lightweight painters. Also, keep the boat as light as possible. Not a single thing hanging off of it. Thanks for all the tips. I wish I had my own canoe with which I could practice. I do have a canoe - but it's a beastly Norwest cedar/canvas 14' that weighs in the neighborhood of 80lbs, and it has a plain thwart. I should qualify the pain I'm experiencing - it's like when one your jokester buddy grabs you by the trap in a Spock-style neck pinch, except closer to the spine/center of the trap muscle. I do exactly the same.. Tensing your trapezius against the yoke guarantees pain.. Since I have been using a hand line to trim the boat and not grabbing the gunwales there is no pain.. I can handle about 1km at a time with my 85 pound royalex using these. Got these from Boundary Waters a few years ago - even though my boat nowadays is very light kevlar, they are still a blessing! Discomfort is understandable if you've never portaged before, but excruciating pain is definitely not. Hopefully it is just a poor yoke fit and not something going on in your shoulders-neck. Try carrying something comfortable around your house. I know what rotator cuff problems feel like so it should never be a matter of pushing through the pain. If you can otherwise carry things on your shoulders with your arms in various normal positions painfree then I'd suggest adjusting your method of carry. 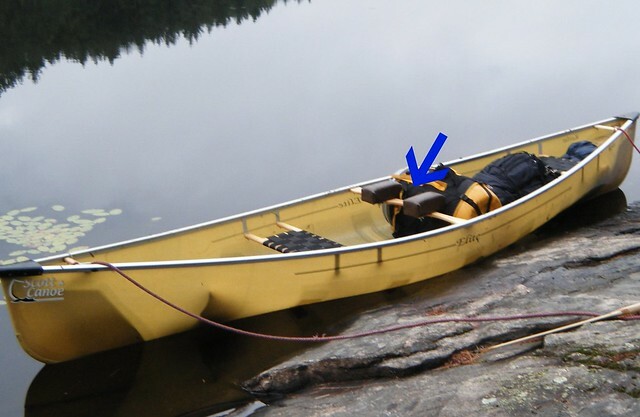 My deep dish yoke on my sub 50 pound canoe was a dream at first, and I managed it hands free for a few trips. Just a matter of balance. Maybe my muscular physiology changed ( for the worse) but I can no longer manage that. I added a pad but that didn't improve things much. That just softened the "horns" of the dish taking away the subtle control between wood and body. I doubt there is really a "one size fits all" with the deep dish yokes. The best you can do is fidget until you find a sweet spot. But there should never be acute pain regardless of fit. I've always thought those padded shoulder boulders looked goofy but they're looking mighty attractive to my old bones right about now. Lots of good info, and I'd like to add my 2 cents. I portage my cedar canvas canoes so I'm well aware of "portage pain" but i wouldn't trade! As others have suggested, finding the balance point is the secret. 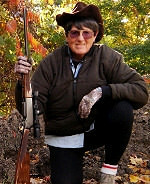 My Chestnut Prospector weighs 78lbs dry and is the only one without a shaped carrying thwart. And its a pain. The centre thwart is perfectly centred and balances the boat but its heavy. Getting it onto my shoulders takes serious concentration. The lightest boat- a Bobs Special- at 58lbs has a specially carved and fitted deep dish yoke. Unfortunately the fitted yoke wasn't fitted for me! So i use a thick yoke pad and it works. My favourite is my 16' Pal at 65lbs dry. Simple portage yoke with a yoke pad and i've carried it miles! It balances easily and rides right where i want it. I should reiterate that my "problems" nowadays are to do with finding that balance sweet spot. I sometimes neglect to tie in the paracord for this purpose and ropes for lining are added only when the trip plans demand them, so at times my canoe is fairly rope naked. It doesn't take much to shift things off balance fore or aft. Even a throw bag or wet sponge left somewhere is enough to alter the feel of the carry. If you portage merely wearing a PFD and a straight slab of a thwart across your shoulders there might be discomfort but should never be acute pain. Balance is everything. Personally I don't like a bow light carry, but prefer to adjust it so with the position the yoke rides on my shoulders.The carved cupped yoke is great for this. I reason that in the event of a hilly portage trail I can adjust the balanced canoe for either grade more easily that way. No fighting a slight stern heavy canoe. Sounds rather finicky I know. But portages are an integral part of our trips and we enjoy them as best we can. It's a great feeling getting the canoe loaded, trimmed and paddled just about perfect for a trip; gear, body and equipment functioning just right in camp and on the water, and everything carried with effort and ease across silent paths. A trip is filled with so very many sweet spots, the portage should be an enjoyable one as well.